As of 12:11PM EDT. Market open. Stock futures pared earlier losses as investors considered a stronger-than-expected reading of U.S. first-quarter gross domestic product and the results of a deluge of corporate quarterly reports. NEW YORK (AP) — A government report showing solid economic growth and a mixed bag of corporate earnings sent U.S. stocks sideways in midday trading Friday on Wall Street. Friday morning started quietly on Wall Street. The U.S. economy grew faster than expected in the first quarter, while earnings reports continue to roll in. Boeing shares moved higher after the company reported earnings on Wednesday. But shares are likely stuck until the 737 MAX situation is resolved. That could actually make them less risky than the overall market for a couple of months. Amazon.com wasn’t the only company to report better-than-expected earnings on Thursday. Ford’s profit far exceeded Wall Street’s forecasts, but the market isn’t leaping higher. U.S. stock futures were more or less flat before the release of economic data. Amazon.com easily surpassed Wall Street’s earnings expectation with its first-quarter results Thursday night, but there is more to think about than earnings. Figures on economic growth and consumer confidence are in the pipeline for Friday. 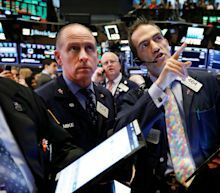 Investing.com - U.S. stocks ticked lower in early trading Friday as disappointing earnings news from Dow components offset better-than-expected economic growth in the first quarter. Japan is set to begin a 10-day holiday from April 27 to May 6 to celebrate the enthronement of the country's Crown Prince Naruhito. Mainland Chinese shares declined on the day, with the Shanghai composite slipping 1.20% to 3,086.40 and the Shenzhen component declining about 1.28% to 9,780.82. In Japan, the Nikkei 225 declined 0.22% to close at 22,258.73 as shares of index heavyweights Softbank Group 9984.T-JP and Fanuc 6954.T-JP declined. Tesla fell after reporting a loss in Q1, but Facebook rose on strong growth. The S&P 500 closed just barely lower on Thursday, as a dive in industrial stocks and concerns about slowing global growth eclipsed gains in Facebook and Microsoft. The industrials sector fell 1.99% with hefty drags from 3M, United Parcel Service Inc and Raytheon Co after they reported disappointing results. Fedex Corp also slumped after UPS's profit miss. U.S. stock indexes were mixed on Thursday, and so were the earnings reports. Industrial stocks were under pressure after disappointing earnings, as (MMM) (ticker: MMM) dragged theDow Jones Industrial Average into the red. U.S. stocks saw some good and bad news amid many earnings reports on Thursday, which had different effects on the three major indexes. Jeremy Grantham, the acclaimed investor credited with predicting the 2000 and 2008 downturns, says that investors should get inured to lackluster returns. Investing.com – Wall Street closed mixed on Thursday as tech stocks racked up gains, led by Facebook and Microsoft, but industrial stocks were hit by a slump in 3M.